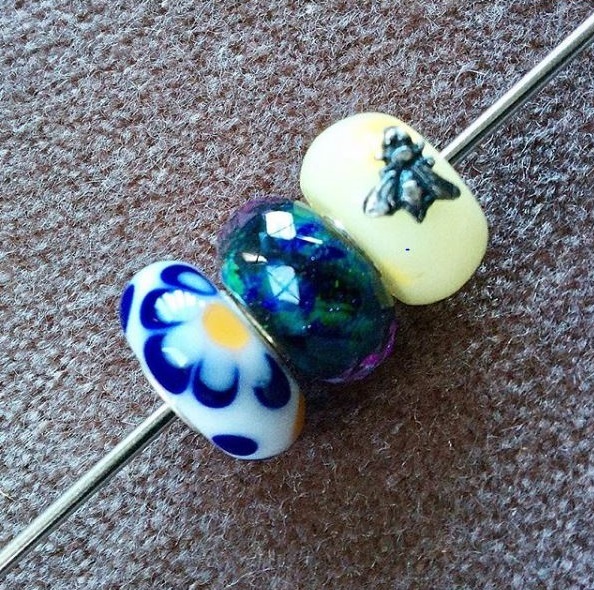 There is a new Trollbeads pop-up shop in London. I managed to visit last week and caught these. Sorry about the fuzzy photo: I have copied it several times and it was difficult to focus on all beads at one time anyway! The Daisy looks like the old ones but was sold to me as a jumbo and has a UU core - but if it is a jumbo, its tiny so I am not sure what it is! Oh, that is a lovely loot I wish a TB store would pop up here, so far only a whiskey shop and some alternative clothes, not beads (but one can always hope ). Wow! Does the Daisy have the pale blue base with white petals? Or white base with pale blue petals? Great haul! Whooo, the daisy bead is a great catch. Pretty cool you have a pop up shop, sounds like a lot of fun to visit. Nice catch! The TB amber is great bead with the little bee! Love your trio. Pop up shop sounds like fun. I always wanted a daisy. If any one has one they want to trade for the pumpkin caterpiller I just picked up in Mentor OH let me know.